After swimming 1.2 miles and riding a challenging 56 miles, half Ironman triathletes face a grueling 13.1 half marathon run. Which courses are hardest? We analyzed dozens of half ironman races to bring you the answer. The Philippines Ironman 70.3 run course is far and away the toughest, with an average 13.1 mile split of 2 hours, 40 minutes, followed by Florida at 2:27. The next two toughest run courses, Cancun and Eagleman, are tied at 2:23. China and Racine, round out the top 5 toughest run courses. Brazil and Austria's run courses are remarkably faster than any of the others, and Mooseman also stands out as a fast course. One might wonder about how tightly the courses are measured. An average half marathon of 1:47? Just 2+ minutes slower than the world-class triathletes in Clearwater? Also see our toughest/easiest half Ironman swim, bike and overall finish times analyses. 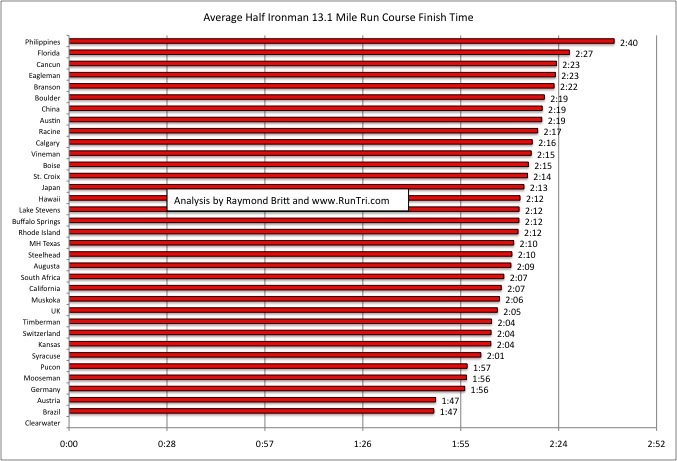 For even more, see our complete analysis of toughest/easiest full Ironman distance races.